Announcement When you possess one of my sculptures you possess more than an object. you possess something that represents thousands of hours of errors and experimentation, years of frustration and moments of pure joy. you don’t just possess a thing, you possess a piece of my heart, a piece of my soul, a small piece of my life, and you are affording me the opportunity to continue to pursue my one true passion, metal sculpture. When you possess one of my sculptures you possess more than an object. you possess something that represents thousands of hours of errors and experimentation, years of frustration and moments of pure joy. 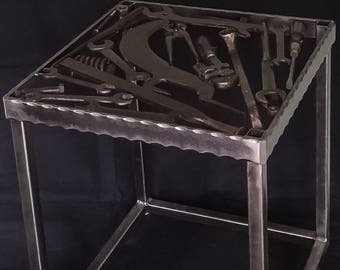 you don’t just possess a thing, you possess a piece of my heart, a piece of my soul, a small piece of my life, and you are affording me the opportunity to continue to pursue my one true passion, metal sculpture. Harley Davidson sculpture Barbie The Welder created. This was presented to Harley as a gift for their 115th anniversary. Barbie The Welder shown with her eagle sculpture in her welding studio. The eagle was created entirely from scrap metal. Death's Widow sculpture created entirely from scrap metal. The sculpture stands 2 foot tall and weighs 52 pounds. Barbie The Welder MIG welding a skull sculpture in her studio. With her unparalleled sculpture design and artistry, Barbie has quickly become a world-renowned metal sculptor, working with major corporations, small businesses, and individuals in thirteen different countries. Barbie lives in Erin, NY where she continues to pursue her greatest passions, creating one of a kind sculptures for exclusive clients all over the world, teaching sculpture design through writing and videos, and inspiring people through her journey! VistaPrint allows me to create products using my pictures.